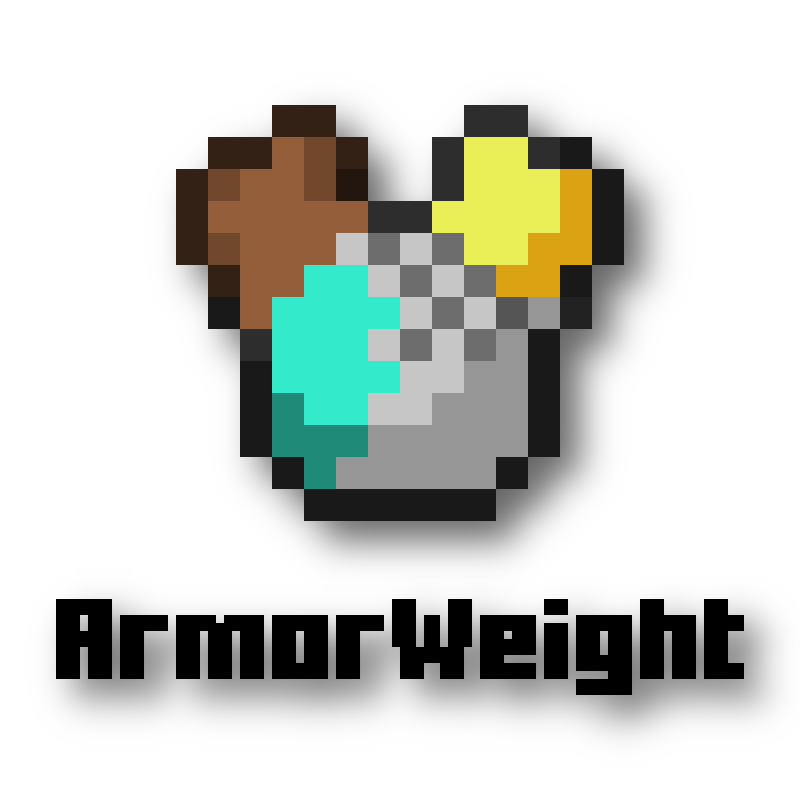 ArmorWeight adds weight to your armor! Heavier armor makes the player more immovable and slower. Decide twice if you want that heavy but strong diamond armor or if that swift leather armor would be better. Balance armor types! Strong armor now gets nerft by making the player slower and more immovable. Also, this increases the power of horses, as you keep your speed on them. More realism! Add realism to fights and duels on your server. More strategy! Tanky or good at escaping? Your players will have to decide and makeup strategies! No mods / use of potion effects needed! Fully configurable! Change every value and message for this plugin! You are free to make a plugin that uses ArmorWeight, but you have to credit me and link back to the plugin. Also, feel free to share your creations and send them to me! Since version 0.3.13 this plugin sends statistics data to bstats.org (respectively before 0.3.13 to mcstats.org). To disable this, set the value "metricsEnabled" config.yml to "false". If you get an exception regarding horse speeds on Cauldron, disable the horse speed effect. ArmorWeight should work with all plugins that do not change the player or horse speeds. There are known compatibility issues when also having the plugin ZHorse installed. Disable the horse speed effect when using it. If you encounter a plugin that is not compatible, please leave a comment I and will get to it. Thirst, making players with heavy armor more thirsty! Like everyone else says, great idea for a plugin. One issue I quickly noticed though is sprint jumping will negate all armor weight effects. Is this intentional? Hello! Thanks for your reply! The same problem actually also occurs with normal (non-sprinting) jumping. This is not intentional, but sadly there is no real way of dealing with this. Bukkit does not support any way to handle jumps. Maybe in the future this will be possible. Sorry for that! Really awesome plugin, good for roleplaying or just adding a more interesting mechanic to the server. I have one suggestion. When you're slowed down by heavy armor and receive the same amount of knockback, it can be a bit harder to fight. Perhaps have weight reduce knockback as well? (but also to a configurable multiplier/degree)? The PlayerVelocityEvent captures knockback velocity. Hello, glad you like the plugin! I really like your suggestion and am planning to implement this. Shouldn't be a big think, but I'm quite busy with exams at the moment, and I don't want to implement this in a rush. So this will have to wait till March, thanks! This plugin is really good ! It gaves to my server a big difference of taste for the armors :-) Thank you ! Hey guys, just wanted to let you know that NoCheatPlus is now compatible with ArmorWeight. Enjoy! It does not seem to work properly when you shift click the armor on. Right now, this plugin only works with the items players wear as armor in the armor slots. All other items will be ignored. Or what do you mean? I have not looked into placeholders etc. but that sounds like a good idea to tackle. Sadly, I don't have that much time for this plugin to make it a Spigot premium thingy, so that's that. I'll update it anyway, doing my best! will you be updating this? I want to add item weights! For every item in my custom server. And is it also possible to make it appropriately work with item stacks, and work with placeholders/featherboard or just experience bar/Action bar? Dude, you should totally make this a spigot premium plugin! Glad you like it! I will do my best! Keep up the good work, me and my players adore this plugin! That's a good question! I'm afraid I can't give you an answer though. In theory, any plugin compatible with changing player speeds (e.g. speed attributes) should work. Please let me know if you find a compatible plugin and I'll link it for others! Hmm.. the page states incomparability with ncp but is there a compatible cheat prevention/detection system?